Nominations close in less than a fortnight for the 2019 WA Disability Support Awards that recognise excellence in improving the quality of life and inclusion for people with disability. The Insurance Commission sponsors the ‘Excellence in Innovation’ category at the Awards, which rewards a person, team or organisation that has developed new or different approaches that improve outcomes for people with disability. An innovative use of technology that makes a significant difference in post-catastrophic injury rehabilitation, care and independence. Kane Blackman, Commission Secretary at the Insurance Commission, says: “The Insurance Commission sponsors the Excellence in Innovation category at the WA Disability Support Awards to recognise those who are contributing to the sector and making a lasting impact on the lives of Western Australians. “Innovation is key to ensuring that the disability sector continues to deliver positive outcomes to people with disability, increasing independence and reducing care costs. This is particularly important to the Insurance Commission given our critical role of providing care and compensation to claimants injured in motor vehicle crashes and at work. 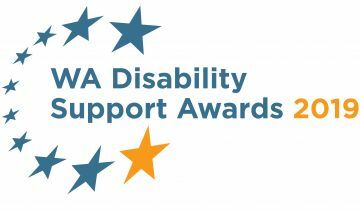 Nominations for this year’s WA Disability Support Awards close at 5pm on Tuesday, 5 February 2019. The nomination form and guidelines can be downloaded from the DSWA website. NDS can provide advice to assist you to develop your nomination. Phone 08 9242 5544 or email awards@nds.org.au. Last year, the winner of the inaugural Excellence in Innovation Award was Perth-based Holly Bridges for her A.R.T. (Autism Reframe Technique) therapy that helps people with autism improve their physical and social presentations. Ms Bridges was recognised for the positive results she achieved through her innovative use of the polyvagal technique, which looks at how the ‘flight or fight’ response exacerbates anxiety in people with autism. National Disability Services (NDS), in partnership with the Department of Communities, established the WA Disability Support Awards. Finalists and winners will be announced at a gala dinner at Crown Perth on Saturday, 11 May 2019. Winners of each category received a cash prize of $2,000 and a trophy.